- With respect to depth of foam and latex, Simmons are somewhat coy about the difference between the Branch River and the Belmore Forest. They essentially say that the Branch River offers “incrementally higher performance foam layers”. - uses an Simmons Evenloft mattress top. These creates a smooth surface which allow one to better feel the comfort layers The NxG series of mattresses also use this. *We have learned from several sources that this refers to a non-prorated guarantee for the first ten years and a pro-rated guarantee for the last 10 years. Please check with the outlet/retailer if you decide to make a purchase. A non-prorated guarantee will provide for a full refund for manufacturers defects while a prorated guarantee will only provide for a percentage of the original cost and this percentage will continue to decline as the mattress ages. You may wish to read our Mattress Buying Tips. The latex used in the Simmons Natural Care mattress is natural. Meaning that it is derived from the rubber tree and not made with petrochemicals. Natural latex is very long lasting, supportive and naturally hypoallergenic – in fact it is resistant to dust mites, mildew, microbes and fungus. 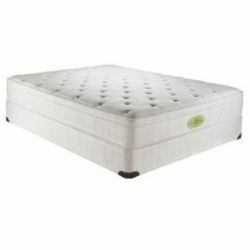 Continuing it’s eco-friendly trend, the Natural Care mattresses also have a layer of base foam that is enhanced with soy, and the breathable mattress cover is created from naturally derived tencel wood fiber that is both biodegradable and partially sustainable (tencel is made from wood pulp cellulose). Simmons pulled out all the stops in creating this environmentally-friendly mattress. Both the wood fiber and the latex used in the Natural Care are Oeko-Tex Standard 100 certified. The Oeka-Tex Association consists of fourteen textile and research institutes in both Europe and Japan and it has agencies and offices in more than 40 countries. The Association is responsible for managing the Oeko-Tex Standard 100. This is a standard that was introduced in the early 1990’s to protect consumers and the general public from harmful substances in textiles. There are a large number of Simons Natural Care Mattresses on Amazon. You may wish to check out the variety and prices.